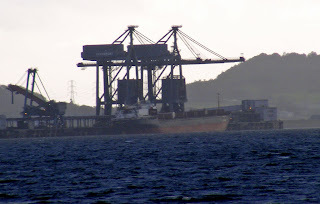 Bulk carrier Admiral Ushakov berthed at Hunterston early a.m. 22 October 2008. Is it only me, or do a lot of the current arrivals appear half empty? In the interim, Hengshanhai spent the day "hingin aboot" the Mull, I take that they have received the advance forecast!